RV Tire Safety: Don't check your tire air pressure. Really... Stop it. Don't check your tire air pressure. Really... Stop it. No, I haven't gone off my rocker as there is some logic behind the title and advice of today's post. For years the advice has been to check the air in your tires every month and on the RV every morning of every travel day. The primary reason for this decade-old advice has been based on the fact that most RVs have at least one tire in overload or under-inflation or both. Also it is a fact that all tires lose pressure over time and since it is the air pressure that carries the load, not the tire, this makes having sufficient air pressure more important on RV application than with your regular car. Why is it more important with your RV? One major reason is that your car probably has a significant margin in the +12% to +25% range while RVs have more like -5% to +5%, with the plus signifying excess air pressure above the minimum needed to support the load. But this doesn't explain why I am suggesting you stop checking your air pressure with your hand gauge each morning. The reason for making this surprising suggestion is the fact that the very act of checking your air pressure can, in a small percentage of the times, result in a slow leak through the tire valve core. In some earlier posts on "valves" I showed the sealing surfaces of the valve core and why they can leak. In my experience, valves generally do not develop leaks and are pretty reliable, but the act of checking your air pressure does open the core and there is a possibility that a small piece of grit can be introduced into the core air seal and this grit can cause a slow leak. Ever wonder why so many people who have a tire sidewall flex failure or "blowout" make the statement, "I just checked the air a couple hours prior to the failure"? Well, this is one of the possible reasons for the small, slow leak. Now, having made the suggestion that the act of checking your air pressure might possibly cause a tire failure so you might consider not checking your air pressure is only a reasonable suggestion IF you have another method of knowing that your tires are properly inflated. 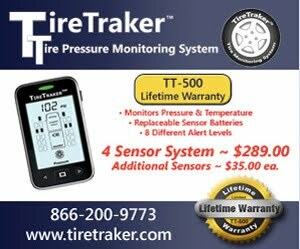 We have that method and it is a Tire Pressure Monitor System. To me that is the ONLY alternative to checking your air pressure every morning, also every rest stop, also every fuel stop -- and even all those checks will miss a majority of the exposure time when a leak can occur. PLUS, the more times you check your air pressure the greater the opportunity there is for the very act of checking if you have a leak could result in a leak. If you have a TPMS you really only need to check its accuracy maybe once a season unless you are getting erratic readings and signals. Using a TPMS will not only make life easier in that you don't have to check the tire pressure multiple times a day, but it will also decrease the likelihood of your actions causing an air leak. If you don't have a TPMS, then you probably should be checking your air pressure frequently -- but just remember that each time you open the valve with your pressure gauge it may not completely seal shut, with a resultant slow leak. If this post gets you to finally make the decision to get a TPMS you might read my post on Best TPMS to help you make a good purchasing decision. Big rig owner/operators have told me this about not using an air gauge to constantly check air pressure. First time I heard this I dismissed it as just "big strapper" talk. But then I found lots of them agree with this. The old tire thumper and a 'trained' (ahem) ear can detect differences in air pressure, though not at the 5 psi level. Not sure if this translates to RV tire checking, but after trucking for 40 years myself (a company driver, not an OO), I use the thumper method when stopping for a break. Lose pressure, not loose pressure. Thank you. Fixed it. Have a great day! Good advice despite the click-bait headline, but I'll add that many people don't seem to know how to check pressure/add air without corrupting the valve. First, keep caps on the stems - they aren't decorative, but help keep out the grit that causes slow leaks of the valve. "Duh", except i've seen a lot of exposed valvecores. *Never* inflate dirty stems. If you discover dirt in the stem, rinse and blow off the dirt, then tap the valve's pin to blow any loose dirt OUT using tire air. Even if you believe the valve is clean, burp the valve anyway before making a good seal with your gauge or inflator - a little sloppiness here may pay off. Now the compressor: burp your inflator nozzle at full pressure a few times to blow any accumulated dirt out off there. Be extra careful if you use gas station air, as people drop the chuck in the mud more often than you would your own. ONLY once the valve AND inflator chuck are clean do you mate them and blow air into the tire. If it seems like I'm being obsessive with the obvious, think about how often you've seen someone (no, never you!) roll up to the compressor, stuff it right on, and spray dirt into their tires. It's a miracle there aren't more leaking valves with how little thought most give them. Unless you corrupt the valve or damage the tire with a curb or nail, tires almost never deflate spontaneously. Checking every morning is definitely insanely too often. I check every 5 drives or monthly, and (knock on wood) have never lost more than 1psi at a time. Now that I mentioned the corrosion issue, when you're done inflating, if you have TPMS and especially if you live in northern "salt" states, make SURE you recap your stems with PLASTIC caps. The original stainless caps, brass caps, plunger type steel check-caps, even some supplied-with-TPMS caps react chemically with the TPMS stem metals (i think usually aluminum based?). Apparently the tire shop here has been seeing a lot of "salt welded" caps since TPMS became standard. ...and you thought tire inflating was stupidly simple! I have read several replies of yours over time and rec you apply as a staff writer or? You are on point and then some with details that challenge or exceed the author, TYVM! RE TPMS stems corroding. Yes that can happen with the OE aluminum ones but is very unlikely with aftermarket bolt in metal valve stems which are usually brass. Another important item on the OE TPMS with aluminum stems is to be sure to use the stainless valve cores as the old brass cores can corrode solid in the stem. I will be at Perry 2016 and look forward to hearing you. I have Tireminders for 3 years. Very happy. I have one of those LOW pressure stories too. Mislead by Manuf. charts.